JAMES CASWELL OF HISTORIA ANTIQUES HAS VERY KINDLY PUT A LINK FROM HIS WEBSITE TO MINE TO PROMOTE EX-VOTO COMMISSIONS. WE MET JAMES LAST JULY WHEN WE WERE OUT IN SANTA MONICA. I'D KNOWN OF HIS STORE AND WAS VERY KEEN TO GET A TRADITIONAL EX-VOTO OF MY OWN. I ENDED UP WITH THREE (YOU'LL NEED TO SCROLL DOWN TO THE 12TH OF JUNE). 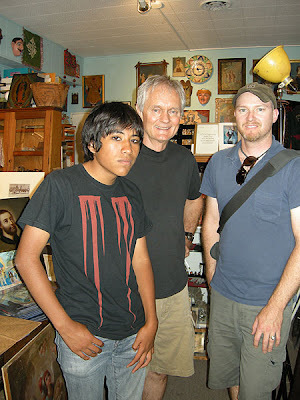 HERE'S A PHOTO OF JAMES AND I AND HIS SON ALBERTO.